My mom always said that her favorite Mother’s Day gifts were homemade. I think that’s a sign she’s a pretty good mom. Sometimes it’s hard though to find a homemade gift idea that is meaningful and that will last. I’ve always thought that homemade photo gifts like this photo rubix cube or these photo magnets are a lot of fun. We’re a book-reading family; so bookmarks are also a good gift choice. They don’t take up much space; they get used a lot, and they are inexpensive to mail. I figured if I could find a particularly cute way to make photo bookmarks then I would have a pretty good Mother’s Day gift on my hands. I knew I had a winner with these front-and-back photo bookmarks because ever since I made them, my husband, who is not usually the homemade-gift-type, has been asking me to make one for him. 1. Take a picture of your child from the front and another in the same outfit from the back. You’ll want to try to have them stand in the same place, and in the same position for both photos (hands on hips, or legs spread apart, etc.) I found that this part was harder than it seemed at first with my wiggly two-year-old! 2. Print the pictures out on your computer printer. 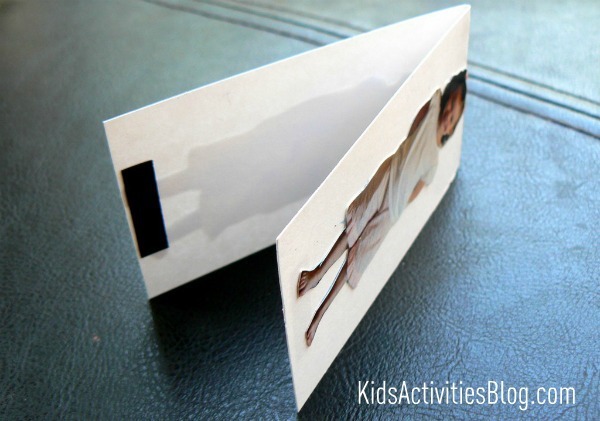 Cut around the figures, and glue onto a thin piece of card stock that is folded horizontally. 3. Cut two small pieces of magnet sheets with adhesive backing. Stick them to the insides of the card stock. You’ll want to play around a little bit with their positioning because magnets can be a bit finicky when they are stuck to each other. Children can help in the making of this gift by using their glue sticks to help glue the photos to the card stock. They might also enjoy picking out the outfit they will wear for the picture or even including props like a pet or a favorite stuffed animal. Previous Post: « Attention Mothers-To-Be! Motherhood Matters Pregnancy Expo Saturday May 12th! 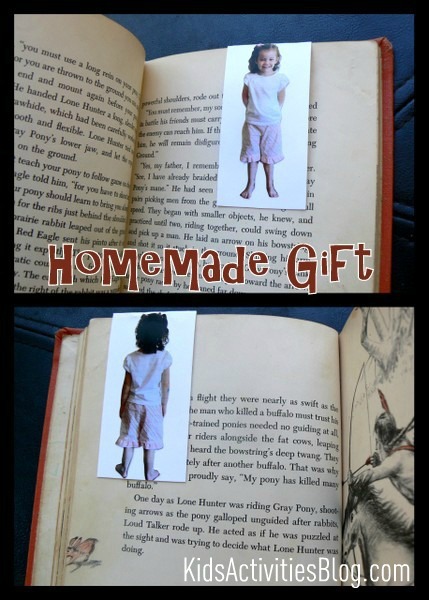 I love your bookmark with the front and back of the child! Really cute and original! What mum wouldn’t like these for mother’s day. Adorable!